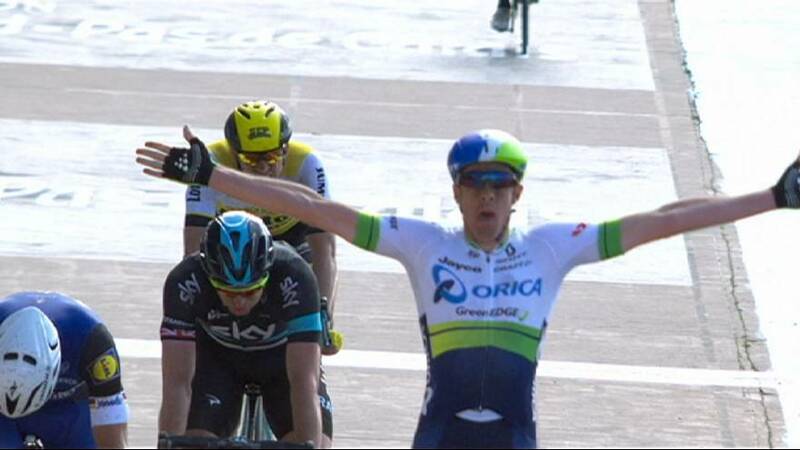 An emotional Mathew Hayman lifted the cobbled trophy after springin a surprise victory at the Paris-Roubaix on Sunday. The third of five classics on the pro cycling calendar took the peloton over 257.5-km of which 52.8 were over the bone-shaking cobbled sectors. The highly-anticipated battle between pre-race favourites Fabian Cancellara of Switzerland and Slovakian Peter Sagan failed to materialise. After multiple failed break away groups, five men finally went clear to dominate the latter stages of a crash-riddled race. The front group included Australian Hayman as well as former world champion Tom Boonen – who was hunting a record breaking fifth Paris Roubaix title. On the finishing track Hayman appeared to have made his move too early but he surprised all by holding Boonen at bay for a stunning victory – his first in 16 appearances in the race.